Love this! I also love a good sale where inexpensive and very entertaining items can be found :) Bravo! Yes! The first thing I thought of when I read your post was those commercials. I always loved them! Your girls are so adorable. Among other things, they have their mama's beautiful hair. I love photos of them! Great post! It gives me so much joy when I see my kids playing together happily. Doesn't happen a lot (less and less as they grow up), but when it does, it is indeed priceless! Yay for entertainment that they love and keeps them occupied for a long afternoon!! And the girls are getting so big! and pretty!!! Isn't it great when they play together and just get along? Mine spend way too much time bickering so it is truly priceless when they get along! Love those commercials! Aren't they still making those commercials? I never would have guessed that they went back as far as 2000! Cooperative playtime is a good thing! Looks like they had a lot of fun! I love those (rare) moments when my boys are playing together with no complaints. Also, my favorite kid expression is that "What ARE you doing?" look Natalie is giving you in the last picture. Makes me laugh every time. A quiet afternoon of play plus several new outfits is well worth $20. I hope you show us the outfit, too! 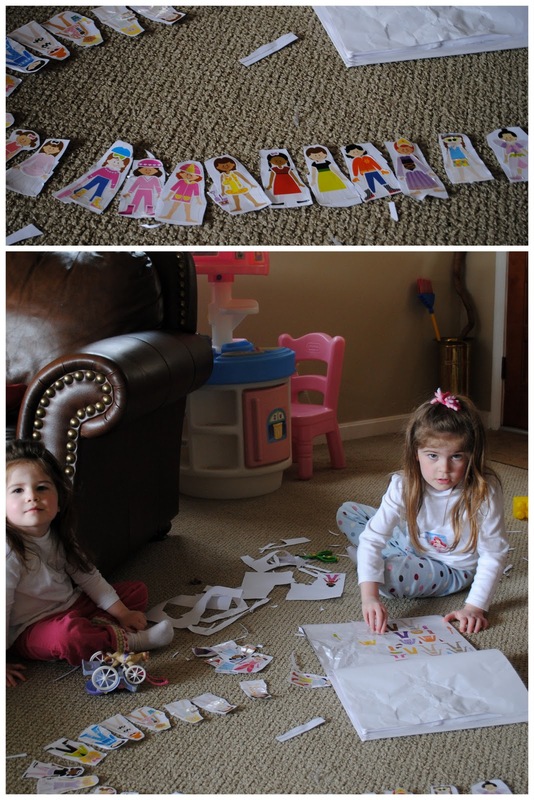 Wow they take their sticker books/doll fashion very serious! So cute!! Awww, I love this! And I was witness to the girl's playing so nicely too :-) Hope they continued after I left :-) I wonder what ever happened to those mastercard commercials? I never see them anymore. So adorable! I loved playing with these paper dolls my grandma brought me back from Paris one time. Your girls are so sweet playing together, too!